Yesterday we went out on the Gulf of Mexico on a pontoon boat with my cousin Wendell. We did some scallop diving about nine miles out. 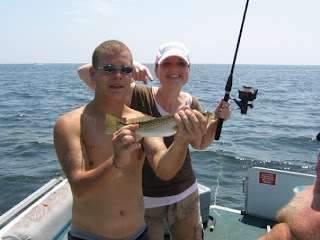 We caught a few fish... a puffer fish (which I understand is very poisonous), a small barracuda (full of teeth), a couple of small perch, and Danneel caught a speckled salt water trout (that she refused to touch). The trout was the largest fish of the day. It measured out at 14.75 inches making it 0.25 inches to short to keep. 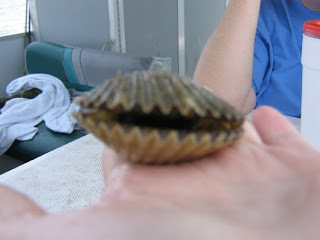 We also did some scallop diving! I was all about the diving... I found 15. It's kinda like Easter egg hunting under the sea. You have to be careful with them too, as they can clamp down pretty hard. 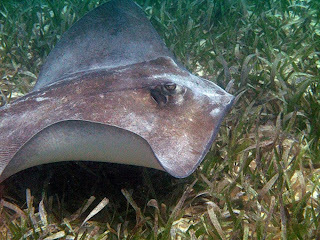 During this we had a stingray encounter. The stingray scared a kid in out party pretty bad. He was screaming "get me out... HELP!!!" 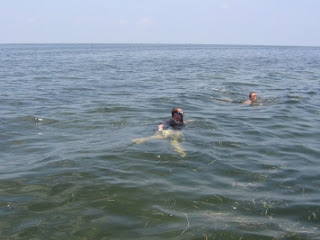 I stayed in the water looking for scallops though. He came over to me curious about what I was doing in his neck of the woods and we circled each other for awhile. We had a lot of fun and caught some UV rays to boot.